A recent workshop on an extinct and very rarely studied language opened a “brand new door to fresh historical perspectives” for Yale graduate student Yuan Chen. Chen, who studies medieval Chinese history, participated in the Kitan Language Workshop, which presented her with a “once-in-a-lifetime opportunity” to learn about theancient language developed by the Kitan people. 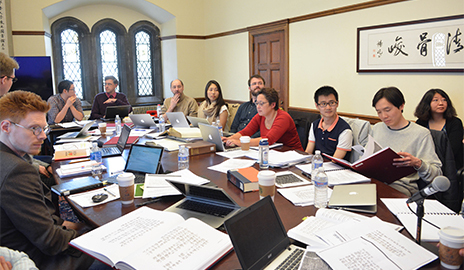 The workshop, which took place May 11-19, was organized by Valerie Hansen, professor of history at Yale, and funded by the Council on East Asian Studies in the Whitney and Betty MacMillan Center for International and Area Studies at Yale, and the Edward J. and Dorothy Clarke Kempf Memorial Fund. It was led by Daniel Kane, an Australian sinologist and linguist who has spent more than a decade on the study of the Kitan language and scripts. Between the 10th and 12th centuries, the nomadic Kitan dominated a large swath of Mongolia and Manchuria and created the Liao Dynasty, a rival to China’s Song Dynasty. The Kitans, who were the first people to make Beijing one of their capitals, originally did not have their own writing system. After the founding of their empire, the Kitans saw the need to invent their own script to define the Kitan identity. They created two scripts by borrowing from the Chinese and Uighur languages. “It is fascinating to learn about how these ancient peoples used language to define their ethnic identity and for empire building,” notes Chen. Chen says that the work done during the workshop was akin to a “detective story” in which information was pieced together from fragmented evidence from different stele inscriptions, epitaphs, and engravings on mirrors or coins. “It was exciting to learn about how the graphs are deciphered,” she notes. “This intense workshop allows me to use an entirely new genre of primary sources in a previously poorly understood language in my research. It not only makes it possible for us to read some of the extant Kitan texts, but also creates the opportunity that participants of this workshop can work together in the future to make more breakthroughs in deciphering Kitan,” says Chen.